The Neugebauer House stands proudly, overlooking Doubloon Bay in Naples, Florida. It has a linear structure that allows for open space, emphasized by large glass windows that let in light and help capture the purity that radiates from its white walls. 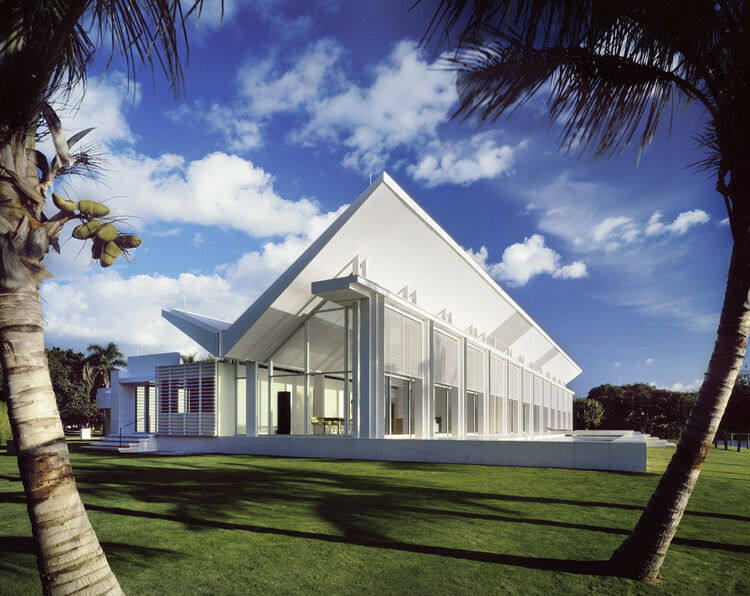 The house is a work of residential art from architect Richard Meier. Construction of the Neugebauer House was completed by 1998 after plans of design began in 1995. Even though it is a residential space, Meier didn’t lose his style of design, which builds off of work done by a pioneer of modern architecture, Le Corbusier, a Swiss-French architect. As an architect, Meier’s constructions focus on geometric designs with a prominent use of the color white. Built for Klaus and Ursula Neugebauer, the house itself is 700 sq. m. and sits on a one and a half acre of waterfront land in a luxurious residential area of Fort Charles Dr. in Naples, Fl. Meier was able to stay true to his creative design while also following city codes and regulations. At the time of the construction of the house, Naples had local design codes that required roofs to be pitched. In order to obey this, the roof was simply inverted, emphasizing the orientation of the house towards the water. Because this is also Florida and hurricanes are a natural occurrence that we deal with every year, the curtain walls that face the water are conveniently hurricane resistant and made from thick laminated glass. The wedge-shaped landscape the house was built on allows the structure an all around view of what Florida truly represents. From the open courtyard, you can see the water that glistens from the sun, and in the surrounding areas, you have 25 royal palm trees that were planted to form an orchard, allowing guests driving by a perfect view at the house.